I am getting into a groove with cooking with J. Since the pesto pasta experiment, we’ve made feel-better pops (inspired by this post, but I tweaked the recipe: 50% low-sugar cranberry juice, 50% echinacea tea, 100 drops of dandelion extract, a tablespoon of honey), watermelon agua fresca, and Monday night, pasta alle noci. These recipes are all basically blender/one pot and/or food processor recipes. So I just chop up the ingredients, have them lined up in a series of bowls, and J feeds them in, one by one. 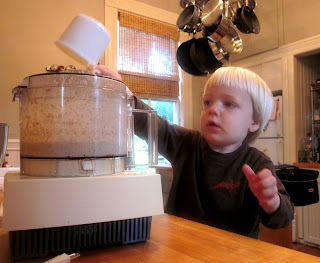 It’s fun, not too messy, and the added benefit is he eats a lot of whatever it is he helps make. And says “I did it myself” a lot, too. Very cute. This is a dish I grew up eating on Sunday afternoons at a countryside restaurant. It was served VERY homestyle and I imagine it was made with a mortar and pestle. I think the nuts must have bene a blend of hazelnuts and walnuts, too. It was served on a long thick noodle,maybe all gitarra, or perciatelli size. But as with other pasta recipes, I make this with a short tube so J can feed himself, like penne rigate for this sauce. Toast the walnuts on a baking sheet in a 350 degree oven for about 10 minutes; set aside to cool while you prepare the other ingredients. Peel 2 cloves of garlic and and combine in food processor with the salt. Add the walnuts, barely process to chop nuts. Add cream, mix quickly (can be by hand or with blade). Taste and add pepper-- it should be a little spicy. Blend some more until you have a thick, whipped sauce-- only til that point, don’t keep processing once it is whipped. Drain the pasta lightly (ok if there is still some water) and mix in the sauce. Add a little of the blended cheese if needed, up to 1/4 cup. Serve, and pass the extra cheese for each to top their pasta with.